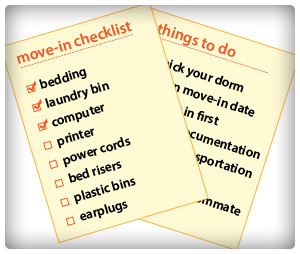 Looking for a to-do list for moving into the dorms? Look no further. Here at MovingGuru, we have all the tips, advice and essentials for moving into your dorm room. Before we go through our dorm move-in checklist, though, let us point out the most important part of moving into the dorms: be ready to have some fun after you’re done. Here are the 7 steps to moving into a dorm room. Pick your dorm and pay up EARLY – Follow your college’s procedures for getting a dorm room as soon as you decide to move into the dorms. At some schools, the best dorm options go quickly. Talk to your roommate – When you learn who your roommate is, contact him or her to ask about what you’re bringing, any pet peeves they have, and any medical issues you should know about. More or less, get to know your roommate. Plan your move-in date – Pick a precise date that you will move into the dorm and get the details together, including reserving a rental truck, if you need one. Figure out transportation – How will you get around once you move in? If you’ll have a car, you’ll probably need to buy some parking. If you don’t have a car, consider a bike, a skateboard or a scooter. Walking certain places on campus can take a while (20+ min.). Gather identification – Put together all the information you need to move into the dorm, including your student ID. Check in first – Before you move anything in the dorm, check in with personnel to get your key and room location. Document the condition of the dorm room – Look around for any obvious problems with your dorm room. Unload – Now it’s time to move in.